A summer favourite, easy homemade bruschetta is a healthy snack or appetizer that makes use of the summer bounty of fresh tomatoes, basil and garlic. Today is exciting because not only do I have a delicious bruschetta recipe for you, but I’ve also created my first video for Living Lou! I’ve been meaning to create some videos for a long time (we’re talking at least two years here) but I never did. I think it was because I was nervous. As you may know, I study and work in film but the idea of creating a video on my own was scary and overwhelming. Not only because I was afraid of making something that was subpar or just plain bad, but because in school (and in the film industry in general), you work with a team. There are experts for cinematography, picture editing, sound editing, food styling…you’ve seen the credits in movies so you know how many people are involved. And guess what, I’m not an expert in any of those areas. I could never be a cinematographer and I would lose my mind sitting in front of a computer screen editing picture or sound all day (or all night). But last week I realized how dumb I was being, letting this somewhat irrational fear hold me back. You see, I may not be Martin Scorcese or Wes Anderson but I do have the skills to put together a little something. So I did a little rearranging of my kitchen, chopped up some tomatoes, basil and garlic for a delicious summery snack and filmed a little video. Enjoy! Let’s talk about this recipe for a minute, homemade bruschetta is so easy to make, and I think it’s the perfect way to highlight the fresh and sweet tomatoes you can get at your local farmer’s market in the summer. You really can’t go wrong with this simple combination of flavours; I’ve been known to eat bruschetta on a piece of toasted sourdough bread for lunch. I had so much fun making this video and I’d love to make more. Let me know what you think of the video in the comments. I love hearing from you guys so you can also vote in the poll below. And as always, I’ve got the recipe here for easy homemade bruschetta, it’s perfect for these beautiful summer days! 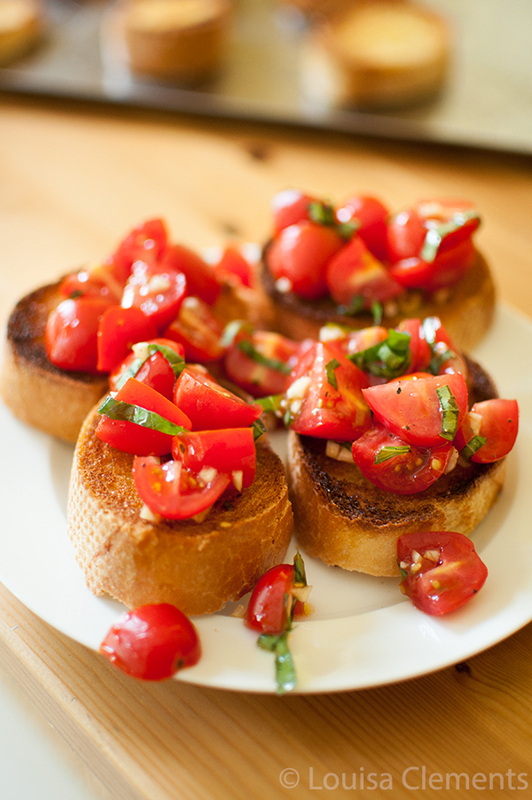 A basic recipe for homemade bruschetta! Perfect for a summery appetizer or light dinner. Whisk together 3 tbsp of olive oil and 1 clove of crushed garlic. Brush olive oil and garlic mixture over bread. Toast bread under broiler for 2-4 minutes (keep watching so it doesn't burn). Drizzle with remaining 2 tbsp of olive oil and season with salt and pepper to taste. Spoon tomato mixture over bread. Can chop tomatoes smaller if needed! I hope you enjoy the video and be sure to subscribe to my channel on YouTube and let me know if you give this easy homemade bruschetta a try in the comments below. Such a simple and flavorful recipe! I loved the video too. I love step by step instructions on recipes. I need to do more of it too, but it is time consuming. The video was beautifully done though! LOVE the vid, Lou! I think it's fantastic that you have the skills to do this, and you should definitely use them. Plus, I learnt something from this - what chiffonade is! Thank you so much, Helen! I'm so glad that you were able to learn something from it! One of my favorites ever, especially in the summer with the abundance of local tomatoes. Great recipe. Thank you Kathy. It's my favourite snack to eat in the summer! OMG, Louisa I LOVE LOVE LOVE your cute recipe video! Please keeping making more and more! And your bruschetta looks so tasty! I loved the addition of the video! The visualization of the steps makes the recipe seem super simple. And I am really excited to try out this recipe in the future. Hopefully it's as easy as you make it look :)Thank you for sharing! You're video is great! I love the idea and simplicity of it! I hope you do more! You've inspired me! Thank you! Your video is great! I love the idea and simplicity of it! I hope you do more! You’ve inspired me! Thank you! Thank you Kelsey! I'm so glad you found it inspiring, I'm working on some more videos now and can't wait to share them! Thank you Lorie, I'm thrilled that you like this recipe!